Hart Moss, M.D., Jennifer I Lim MD, K. David Epley, M.D., Koushik Tripathy, MD (AIIMS), FRCS (Glasgow), Michael Nathan Cohen, MD, Vinay A. Shah M.D. and Vinay A. Shah M.D. Assigned status Up to Date by Vinay A. Shah M.D. on December 21, 2014. First described by Adams in 1883, but named for Dr. Friedrich Best, who presented a detailed pedigree of the disease in 1905, Vitelliform dystrophy, or Best disease, is a hereditary retinal dystrophy involving the retinal pigment epithelium (RPE), and leads to a characteristic bilateral yellow “egg-yolk” appearance of the macula. This disease tends to present itself in childhood or early adulthood and usually portends a good visual prognosis. Best vitelliform dystrophy is inherited in an autosomal dominant pattern, with diminished penetrance and a highly variable expression. The causative gene, located on chromosome 11 (11q12.3), BEST1 (VMD2) encodes for the transmembrane protein bestrophin 1, which is located on the basolateral aspect of the plasma membrane of RPE cells. Although the protein's exact function remains incompletely described, it is linked to abnormal chloride conductance, which likely disrupts fluid transport across the RPE and leads to accumulation of debris between Bruch's membrane and the RPE/photoreceptor complex. It is believed that mutations in BEST1 do affect RPE metabolism and subsequently, because of its close relationship to the RPE, affect the function of the outer retina. There are over 200 mutations described in BEST1, which are often associated with the autosomal dominant diseases of Best vitelliform macular dystrophy, retinitis pigmentosa, and autosomal dominant vitreochoroidopathy. Recently, an entity called 'autosomal recessive bestrophinopathy' has been described, and novel mutations in the BEST1 gene have been found to support its existence. Differing from Best vitelliform dystrophy, this is an even more rare, autosomal recessive disease resulting from bi-allelic mutations in BEST1, characterized by a multifocal vitelliform dystrophy with the presence of subretinal fluid. Best disease is autosomal dominant, so children of affected parents have a 50% chance of receiving the gene. However, there is diminished penetrance and marked phenotypic variability. Currently, it is believed that Best disease represents a primary disturbance of the RPE. It is theorized that the abnormal chloride channel in the RPE leads to a buildup of lipofuscin, a retinal breakdown pigment, between the outer retina and the retinal pigment epithelium. This buildup leads to the appearance of the typical subretinal vitelliformm lesion often described as an “egg-yolk” lesion, and eventually leads to slow, or mild to moderate visual deterioration. Choroidal neovascularization (CNV) is the most significant potential sequelae and can cause rapid, significant visual loss. Histologic examinations have demonstrated mainly RPE atrophy, with good preservation of Bruch’s membrane and the choriocapillaris. Interestingly, there is yet to be a histopathologic analysis of the intra-lesional yellowish-orange material. The diagnosis of Best disease is primarily made based on clinical appearance, however family history and adjuvant diagnostic testing can help confirm the diagnosis. Visual acuity is minimally affected, especially in early stages. Loss of vision is often asymmetric and is impossible to predict from the visualization of the fundus. Fundus finding is remarkably drastic compared to the good visual acuity. As the disease progresses, patients may experience a slow, bilateral decrease in visual acuity, central scotoma, or metamorphosia. With secondary CNV, visual decline can be rapid, however. Often the patients will be hyperopic with some degree of astigamtism. Most frequently, vitelliform dystrophy is a bilateral process, although unilateral changes have often been reported. The classically described vitelliform structure resembles an egg yolk in the posterior pole, but at times is more orange, or somewhat elevated with a dark border. The retinal vessels will traverse the edge of these lesions undisturbed. At times, multiple vitelliform structures can be seen at once, but often these lesions never occur. Stage I (Previtelliform): normal vision, normal or only subtle RPE changes (tiny, central honeycomb structure centrally) with abnormal EOG. Stage II (Vitelliform): classic “egg-yolk” lesion. 30% have ectopic lesions. Normal vision or mild vision loss. Stage III (Pseudohypopyon): layering of lipufuscein. Vision similar to stage II. Stage IV (Vitelleruptive): breakup of material gives “scrambled egg” appearance. Vision may be similar or mildly decreased from stage I/II. Stage V (Atrophic): Central RPE and retinal atrophy. Vision may range from 20/30 – 20/200. Stage VI (CNV): This complication occurs in about 20% of patients. Vision often decreased to 20/200 or worse. Although Best disease can usually be diagnosed clinically, several tests may be helpful in confirming the diagnosis. Electro-oculogram (EOG): Universally abnormal, with an Arden ratio (light:dark) of 1.5 or less. Optical coherence tomography (OCT): Can be used to localize the vitelliform lesion to the subetinal space, demonstrate thickening of the cone outer segments, and can be used to evaluate for fluid associated with CNV. Fluorescein angiogram (FA): hypofluorescence of typical vitelliform lesion, and as the disease progresses a mixed pattern of hyper and hypo fluorescence eventually gives way to hyperfluorescence of the atrophic stage. Fundus Autofluorescense (FAF): During the earlier vitelliform stages, hyperautofluorescence predominates. This hyperfluoresecence settles with the pseduohypopyon stage, and becomes mottled with areas of hypoautofluorescence during the vitelleruptive stage, and eventually becomes hypofluorescent during the atrophic stage. Changes seen with FAF may precede or appear more striking than with ophthalmoscopy. Genetic testing for Best disease is available. 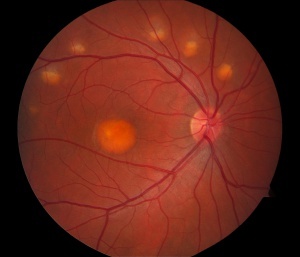 The differential diagnosis of Best disease includes adult foveomacular vitelliform dystrophy (within the spectrum of pattern dystrophies), age related macular degeneration, dominant drusen, central serous retinopathy, toxoplasmotic retinochoroiditis, solar retinopathy, macular hole, or other causes of central macular atrophy such as toxoplasmosis or myopic degeneration. Of note, mutations in the VMD2 gene can lead to a wide spectrum of disease, including adult onset foveomacular vitelliform dystrophy, autosomal bestrophinopathy, autosomal dominant vitreoretinochoroidopathy, and the “microcornea, retinal dystrophy, cataract, and posterior staphyloma" syndrome. The EOG is universally abnormal in all of these conditions. There is no medical or surgical management for Best disease. CNV, however, can be a potentially devastating complication. Application of anti-VEGF therapy for CNV in the setting of Best disease has shown potential for improving outcomes, and photodynamic therapy has been attempted as well. American Academy of Ophthalmology. Retina/Vitreous: Best disease (Vitelliform dystrophy) Practicing Ophthalmologists Learning System, 2017 - 2019 San Francisco: American Academy of Ophthalmology, 2017. Ryan SJ. Retina, 4th edition. Volume II; Medical Retinal, editor Schachat AP. Elsevier Inc, 2006. Retina and Vitreous, Section 12. Basic and Clinical Science Course, AAO, 2009-10. Best's vitelliform dystrophy. Blodi CF, Stone EM. Ophthalmic Paediatr Genet. 1990 Mar;11(1):49-59. Choroidal neovascularisation secondary to Best's disease in a 13-year-old boy treated by intravitreal bevacizumab. Leu J, Schrage NF, Degenring RF. Arch Clin Exp Ophthalmol. 2007 Nov;245(11):1723-5. Intravitreal bevacizumab and triamcinolone treatment for choroidal neovascularization in Best disease. Cakir M, Cekiç O, Yilmaz OF. J AAPOS. 2009 Feb;13(1):94-6. Combined photodynamic therapy and intravitreal triamcinolone injection for choroidal neovascularization in Best disease, M. Nobrega, C. Bortolotto and M. Farah, Can J Ophthalmol 42 (2007), pp. 761–762. Functional and clinical data of Best vitelliform macular dystrophy patients with mutations in the BEST1 gene. Querques G, et al. Mol Vis. 2009 Dec 31;15:2960-72. Phenotypic variability due to a novel Glu292Lys variation in exon 8 of the BEST1 gene causing best macular dystrophy. Sohn EH, et al. Arch Ophthalmol. 2009 Jul;127(7):913-20. Querques, M.C. Bocco, G. Soubrane and E.H. Souied, Intravitreal ranibizumab (Lucentis) for choroidal neovascularization associated with vitelliform macular dystrophy, Acta Ophthalmol. 86 (2008), pp. 694–695. Andrade RE, Farah ME, Costa RA. Photodynamic therapy with verteporfin for subfoveal choroidal neovascularization in best disease. Am J Ophthalmol 2003;136:1179–1181. Clinical and molecular genetic analysis of best vitelliform macular dystrophy. Boon CJ, et al. Retina. 2009 Jun;29(6):835-47. Photodynamic therapy for childhood choroidal neovascular membrane associated with Best's vitelliform dystrophy. Rishi et al. Retinal cases and Brief Reports. 3:288-292, 2009. Duncker T, Greenberg JP, Ramachandran R et al., Quantitative fundus autofluorescence and optical coherence tomography in best vitelliform macular dystrophy. Invest Ophthalmol Vis Sci. 2014;55:1471-1282. Fung AT, Yzer S, Goldberg N, et al., New BEST1 mutations in autosomal recessive bestrophinopathy. Retina. 2015 April; 35(4):773-782. This page was last modified on April 3, 2019, at 15:20. This page has been accessed 154,705 times.